Good news to our PISO FARE friends!!! On sale are the Cebu Pacific Air promo tickets 2017 to select local and international destinations! The new Cebu Pacific promo fare includes flights for June, July and August 2017. This is perfect for your summer escapades. 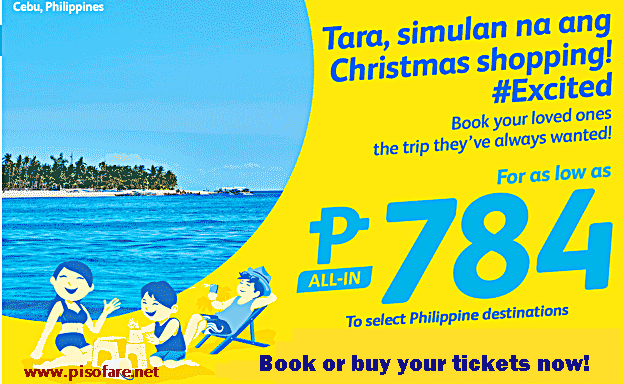 The sale tickets of Cebu Pacific start at P784. This is for Manila to Cebu promo fare. Other local routes are as low as P884 for several destinations in Luzon and Visayas. Promo tickets Manila to Mindanao cost P1,084. Cebu Pacific international trips costs as low as P1,499. Foreign destinations on sale include Asian cities, Middle East routes and Sydney, Australia. Promo fare tickets are good for one-way flight and cover the base fare, Web Admin Fee, taxes and fees as well as 7 kilos hand carry bag. Cebu Pacific sale tickets are LIMITED and may not be available in all flights. Book or buy fast as the promo ends by November 13 or until there are available seats! We check availability of Cebu Pacific promo fare online. See below the Manila to Cebu sale flight 2017. Manila to Bacolod, Boracay (Caticlan), Cauayan (Isabela), Iloilo, Kalibo, Laoag, Legazpi, Naga, Roxas, San Jose (Mindoro), Tacloban or Tuguegarao. Now, have you prepared your travel bucket list? Look at the amazing local and international destinations covered by the promo. You have 3 months to choose from for your vacation dates. To help you decide on your travel dates, check the List of Long Weekends in 2017 HERE. Domestic trip tickets from Manila, Cebu and Caticlan cover the domestic terminal fee while terminal fee for the other airports must be paid at the airport during departure. Online booking at www.cebupacificair.com is the fastest way of getting the low fares. You don’t have a credit card? That is not a problem. You can pay for the ticket booking at Cebu Pacific accredited Payment Centers. You may also call Cebu Pacific hotline at: (02) 7020 888 (Manila) or (032) 230 8888 (Cebu) and reserve your promo fare ticket with their Customer Care Agent. Buying the Cebu Pacific low fare at the ticket outlets or booking offices could be another option. Do you want to book online and need help in booking your flights? You may click this BOOKING GUIDE. If you are not aware where to buy your tickets in Metro Manila, check this LIST OF TICKET OFFICES. Cebu Pacific promo fares are LIMITED! If you want to get the lowest fare, book online now or buy your tickets from the ticket office nearest you! Watch out for more Promo Fares and PISO FARE in our Facebook page: PISO FARE Tickets !! !